As you can see from the blurb, Five years ago, Abby Chandler cheated Death and that day still haunts her. Abby's mother's dead because of her, maybe not directly but indirectly, yes. Her life now is completely different from what it used to be - everything's bits and pieces. All she's got now is a broken family and a guilty conscience. 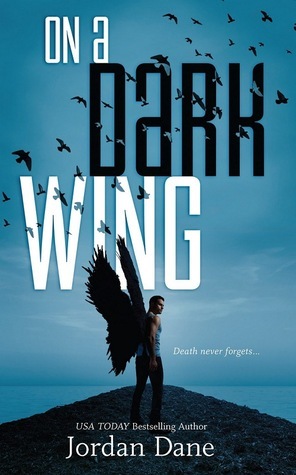 When I read the blurb of On a Dark Wing, I was really excited. I expected a different story, something about Death - a little darker. I didn't know that it was about love. My bad. However it doesn't affect how good the book was. The basic gist of the plot is, Abby escapes Death, Death falls in love with her (yes, he has feelings and all that) and the story goes from there. Let's begin with Abby. Like any teenager who goes through a trauma, Abby's blaming herself for her mother's death. But Abby's not just guilty, she's a bit erratic. She's got wild mood swings and a lot of anger and resentment towards her father. The accident didn't just affect Abby but also her father, who now barely resembles what he used to be before that day. I'm not sure if I like Abby. Sure, she's a teenager and it's realistic that an adolescent girl can't cope with her mother's death and acts out but a lot of times, her bad behavior and immaturity got on my nerves. I also couldn't relate to her obsessive 'crush' on Nate. It seemed a little too extreme to be believable. Tanner is Abby's best friend and the only character that I found relatively normal/sane and significant. He's also a huge contrast when compared to Abby. I always go for the hot, popular guy in any story but Nate just bored me to death. Maybe it was the mountain climbing, I'm not sure. I'm not sure what my opinion on Death is. Well, I guess the whole part about Death having emotions is pretty cool but I don't like the fact that he feels extreme emotions - such as love. I mean, it's Death. He's supposed to be, indifferent and above human emotions. I read The Book Thief recently, haven't finished it yet but I absolutely loved the way Death was portrayed there. His words were powerful with a touch of sarcasm. That may be why I didn't love his portrayal in this book. That being said, On a Dark Wing is an entertaining and mysterious read, maybe not excellent but definitely not bad either. It kind of falls into the stereotypical type of YA Paranormal, but doesn't bore you. Hi there, You've done an incredible job. I’ll definitely digg it and personally suggest to my friends. I'm sure they will be benefited from this web site.